I shot Fenal and Vinny's Indian wedding at the Marigold in Somerset, NJ. First off let me start off by saying that the Marigold is one of the newest venues in NJ, and it's also been very popular among my clients. The grounds are beautiful and the halls are grand, and together this makes for a perfect venue for a South Asian bride. It was a beautiful fall day, and since we didn't have many trees around, I found this "prop" before arriving at the venue so that I can add a touch of fall into their photos. 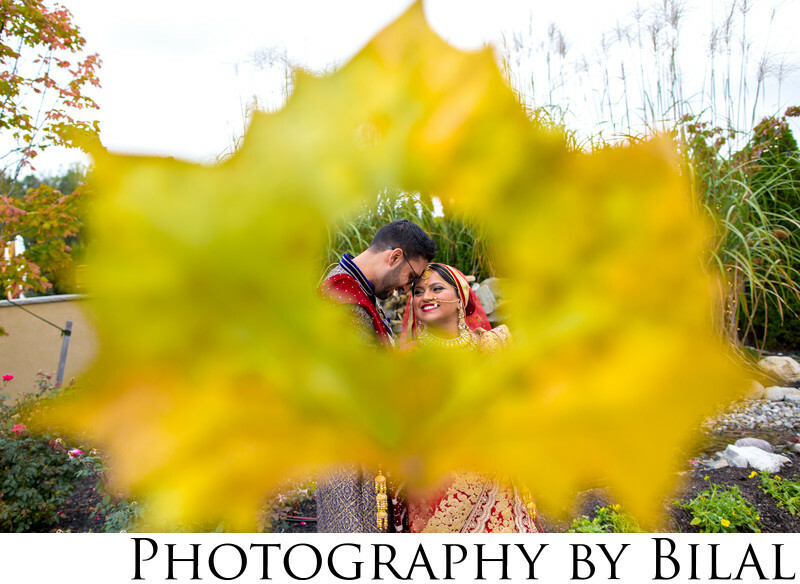 I created a small hole in the center of the leaf to frame the couple, held the leaf up with my left hand while holding the camera in my right. It was no easy task holding a heavy camera steady-but I finally managed to get the shot I wanted. I had to use a wide lens, in this case I used my 24mm lens, otherwise the I wouldn't have been able to get the entire leaf in the frame. I thought it would be a nice touch to a fall wedding-and the couple ended up loving the idea! I always like to think outside the box when it comes to wedding imagery. Check out my Instagram for more shots from this amazing wedding! Location: 315 Churchill Ave, Somerset NJ 08873.